JOIN THE INTERNATIONAL GOLFERS CLUB!! Fill in the online form, post email or fax your permission to play, or 3 recent score cards. Your membership pack and handicap certificate will arrive within 5-7 days! Join today for just 116 Euros! Avoid expensive golf club fees by having a regularly monitored handicap which is recognised worldwide for just £65 a year plus an initial joining fee of £20. (approx.. 116 Euros). Founded in 1990, the International Golfers Club is affiliated to the Golf Club Great Britain and provides membership and a worldwide recognised handicap golf card. The scheme is open to golfers of all abilities, all you need to do is submit three scorecards marked and signed by your fellow player from friendly, social rounds. Alternatively, copy of your "Permission to Play" certificate from your golf professional/tutor can be submitted for an initial handicap which is usually 54 in Germany or 45 or 36 in Austria or Switzerland. You can check your Golf Handicap on line, when you join with our range of membership options. 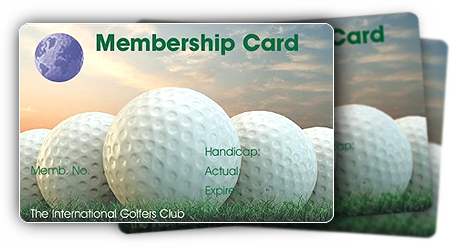 Get the best regularly monitored recognised handicap certificate now, with numerous added benefits and experience the difference with our Internationally recognised handicap card. Recommend a friend and receive £15 discount on your next renewal subscription. So if you want a International golf handicap scheme, click here. The Golf Club Great Britain is pleased to announce a special deal with Crown Golf, EuropeÃ­s largest owned and operated golf group. Enjoy 2 for 1 green fees at all Crown Golf Pay and Play courses (except Pine Ridge) valid Monday to Thursday. Simply call 0800 781 4476 and ask for Nina McLellan, and quote your GCGB membership number. Golf Club GB: UK golfing club helping you to get a golf handicap certificate with handicapping scheme. Discount golf equipment, card, online shop, merchandise, trips. Also golf insurance.